“I’ll put myself between you and any bear. “Walking out” is a story about a father and son who experience their annual get-together again and try to strengthen the wafer-thin bond that still exists between them. In addition, it’s also a story about survival in the wild nature. The well-known story of man against nature and defying all sorts of hardships. If you see a summary somewhere that mentions some fierce-looking bears and their behavior towards this moose chasing couple, then you shouldn’t get too excited. Because this section is just like the rest of the film. Fairly common. So don’t expect exciting images as in “Backcountry” or “The Revenant“. Living like a Grizzly Adams has his charms. 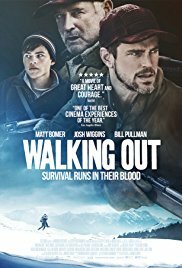 Unfortunately, the rest of the film is as empty as the snowy plain of Paradise Valley in Montana where these two are looking for the colossal moose chosen by Father Cal (Matt Bomer) for his son David (Josh “Hellion” Wiggins). Besides the fact that this is a kind of tradition in his family where young men hunt their first big game at the age of 14. This is also a way for Cal to load up his meat stock for the winter to come (“Well, they make 600 pounds of delicious meat. A winter’s worth.“). The reason why Cal left his family and retired to live as a Grizzly Adams in the middle of nowhere isn’t really clear. Maybe he made that decision during a nostalgic moment and there was this urge to return to the place where he and his father used to go hunting. Maybe he hopes to hang out with his son and teach him the art of hunting so maybe David also gets the taste of living in this primitive way. But the way David is attached to comfort and electronic gadgets, however, makes me suspect that this is just vain hope. Ravishing images of this wild country. What can you expect while watching this movie? First of all, a dozen beautiful images of nature images which are perfect for a postcard. Are you an avid nature lover? Or you hike through the woods at regular times? Or you joined the scouts and experienced a series of camps in the past? Well, in that case, this film will get you into the mood with all its campfire moments. Furthermore, it’s a beautiful story about the faltering relationship between a father and son. A film about hunting and the art of hunting. Cal tries to make it clear that there is a big difference between hunting wild and simply killing it. And this on the basis of his own moose story. Cal’s youth experience is told throughout the film using flashbacks. A romanticized story in 8mm camera image quality. A movie about perseverance and mutual trust. And then there’s the incident after which the roles are reversed. Undoubtedly the most intense part of the entire film where perseverance plays an important role. The film also shows how the wide rift between the two slowly becomes narrower. David who secretly wished he wasn’t there at the beginning but rather would have been in his comfort zone in Texas. And he seems slightly annoyed during difficult conversations. And Cal believes that his son has become too soft. These impressions tilt as the journey progresses and give way to mutual trust and admiration. “Walking out” is a beautiful nature film and also shows how complex human feelings are. But I can’t really call it exciting.